U.S. Army Apologizes For 'Repugnant' Photos Of Dead Afghans : The Two-Way Germany's Der Spiegel magazine today published three photos of U.S. Army soldiers posing with the corpses of dead Afghans. The images are connected to an already highly charged event — the deaths of three unarmed Afghans. Five soldiers are charged. Germany's Der Spiegel magazine today published three photographs of U.S. Army soldiers posing with the corpses of dead Afghans — images that were quickly condemned as "repugnant" by an Army spokesman. "One of the published photographs shows a key figure in the investigation, Cpl. Jeremy Morlock of Wasilla, Alaska, grinning as he lifts the head of a corpse by the hair. Der Spiegel identified the body as that of Gul Mudin, whom Morlock was charged with killing on Jan. 15, 2010, in Kandahar Province. "Another photo shows Pvt. 1st Class Andrew Holmes, of Boise, Idaho, holding the head of the same corpse. His lawyer, Daniel Conway, said Sunday that Holmes was ordered 'to be in the photo, so he got in the photo. That doesn't make him a murderer.' "
Following the appearance of the photos on newsstands, Army spokesman Col. Thomas Collins said the images depict acts that are "repugnant to us as human beings and contrary to the standards and values of the United States Army, the AP says. "We apologize for the distress these photos cause." As Reuters says, dozens of photos related to the case have been seized as evidence by military investigators. They are, the wire service adds, "intensely embarrassing for the United States and have drawn comparisons with pictures of Iraqi prisoners taken by U.S. military personnel at the Abu Ghraib prison in Iraq in 2004." Indeed, the photos' existence has been known about for months — and there are reported to be many more. The Army had hoped they would not wind up in the media before the soldiers' trials. It's not known how Der Spiegel got them. "Morlock's court-martial trial is scheduled to begin Wednesday, with the defendant expected to agree to a plea deal that would result in a prison term up to 24 years with a possibility of parole earlier. "His agreement to testify in future trials will likely make him the star witness against the other charged soldiers — Staff Sgt. Calvin Gibbs, Pfc. Andrew Holmes, Spc. Michael Wagnon and Spc. Adam Winfield." Morlock, left, and Holmes. 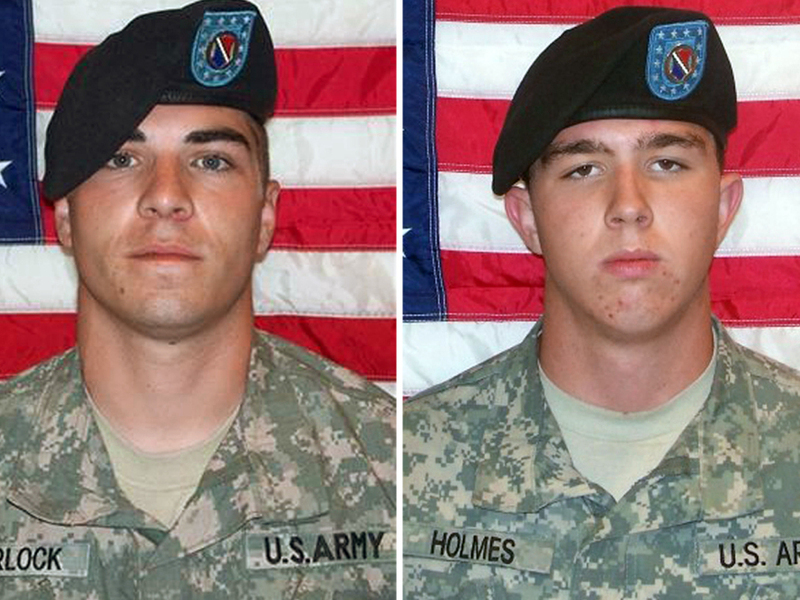 Two of the soldiers charged in the incident. We don't see the photos on Der Spiegel's website (or anywhere else at this point). The Guardian says that "commanders in Afghanistan are bracing themselves for possible riots and public fury triggered by the publication of 'trophy' photographs of U.S. soldiers posing with the dead bodies of defenseless Afghan civilians they killed." Update at 3:05 p.m. ET, March 22: The photos are starting to appear on other news sites, including those of the Daily Mail and The New Yorker.